It’s not a secret that I can’t pass up a taco. Being from Texas, I consider tacos a delicious and ingenious art form. They’re endlessly adaptable, they’re compact and they can be held in a hand. What’s not to love? I still love tacos after my recent visit to Surfside Taco Truck, but they seriously tested the limits of that love. Unlike most food trucks that start life mobile and perhaps, someday, graduate to a brick-and-mortar location (I’m looking at you decliciously wonderful District Taco), Surfside started as a restaurant and unveiled its food truck last October. Perhaps that’s why the food was so bad. Perhaps they are leftovers from the restaurant. Things started off well. I went at 12:25 on a sunny Tuesday, right at the height of the lunch time rush. The food smelled divine, so I had no problem making a decision. The line wasn’t too bad, probably about a dozen or so people in front of me and it was moving. It took me about six minutes to order and it’s a pretty easy ordering process. There’s three types of tacos (grilled fish, grilled chicken and pork carnitas), a burrito option and for those watching their waistlines, a bowl option. I ordered a combination, opting for one grilled fish taco (with corn and black bean salsa, guacamole and lime sour cream) and one pork carnitas (with guacamole and lime sour cream) and paid $9, which is a bit steep for two tacos. I also bought a humongous water for $2. The other drink options were Coke and Diet Coke. Kinda skimpy on the drink options, in my opinion. My food came out very quick after, probably just a minute or two. They do take credit cards, which is nice. They had forks and napkins set out in front of the truck, but no other condiments. They do apparently have salsa, but you have to ask for it. On first impression, the rice looked very unappetizing (and hold up – where are the beans? And what about some tortilla chips?). It looked dry and yellow, which I immediately discovered were both true. There were hard grains throughout, and it was very salty. The yellow color was due to all the butter they had sprayed on it, ostensibly to keep it moist. Fail. 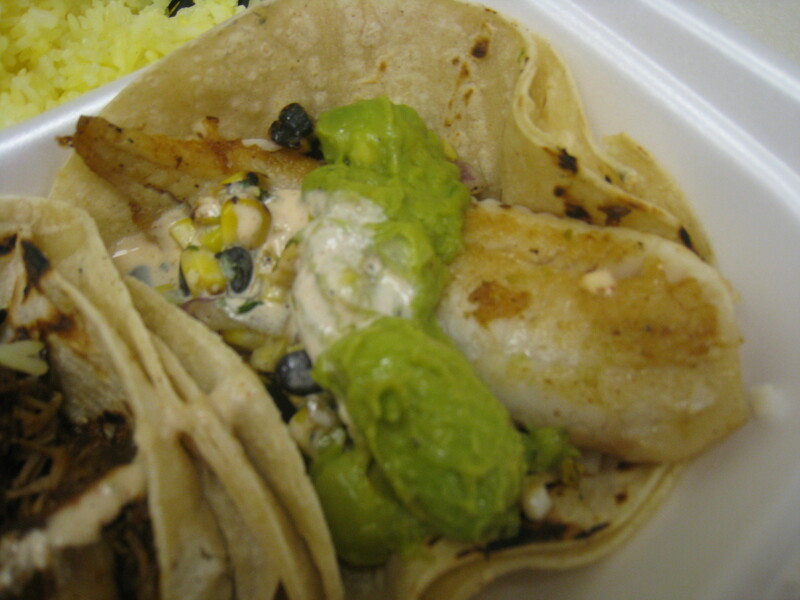 The fish taco was very well-prepared, moist and flaky, but it was also very flavorless. The corn and black bean salsa was also not very memorable – maybe some sort of Mexican slaw would be a better choice. And the guacamole was just mashed avocado – no cilantro or any kick to it. There was also some cream sauce in there, but there either wasn’t enough or it was also flavorless. 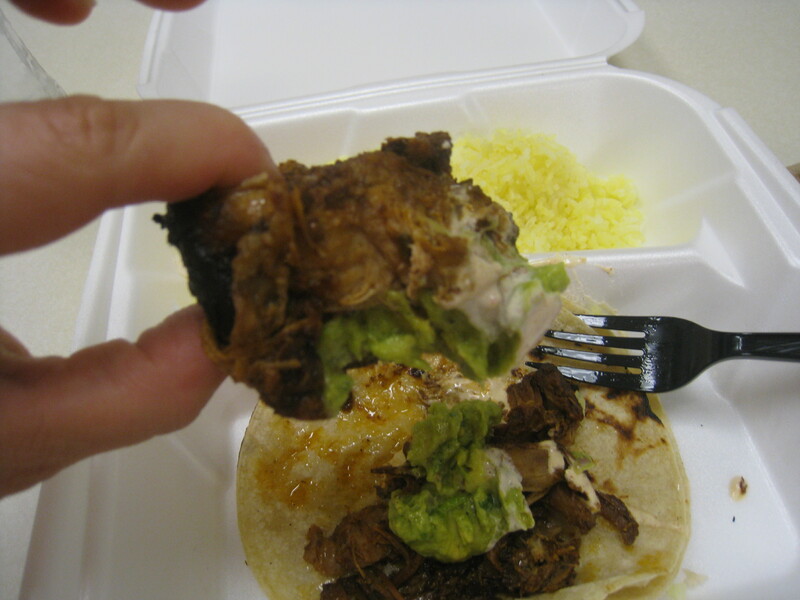 My disappointment in the fish taco was about to be amplified three-fold by the pork carnitas. They were totally dry and flavorless. And there was this one giant piece of meat I had to break down into bite size pieces. While doing that, I noticed that it was totally overcooked. It was charcoal. The carnitas taco didn’t come with any salsa or anything and it definitely could have used it. 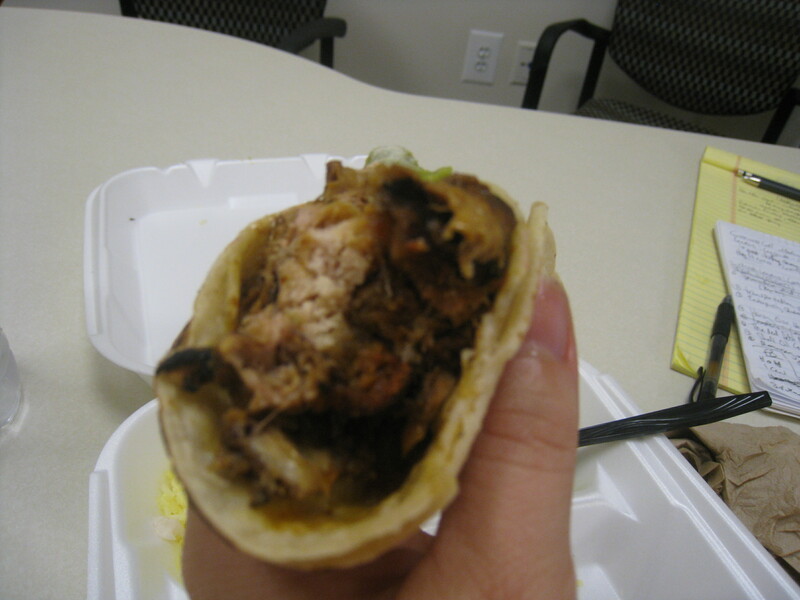 But the true measure of a taco is the tortillas and Surfside disappointed me there as well. Look, I don’t expect every taco truck in DC to make their own tortillas, but at least get some quality tortillas. These, despite being layered with two tortillas, fell apart. Just crumbled. So, to sum up: not a lot of drink options, no salsa (unless you know to ask for it), no chips, no beans, no dessert options, dry, salty rice, bland guacamole, and flavorless taco fillings (including one so dry you could chip a tooth on it). I’m going to have to give Surfside Taco Truck zero out of four wheels. Well, you’re my kind of gal if you order a fish taco and a pork taco. In my world, those are the two main food groups. ; ) We have a Mexican place that makes the best fish taco I’ve ever had… sometimes I dream about when I can get the next one. A disappointing one would probably only get me to my next Mexican taco truck to try another one!